Strokes and heart attacks often strike without warning. But, a unique application of a medical camera could one day help physicians know who is at risk for a cardiovascular event by providing a better view of potential problem areas. A new paper in Nature Biomedical Engineering reports proof-of-concept results for this new imaging platform for atherosclerosis. 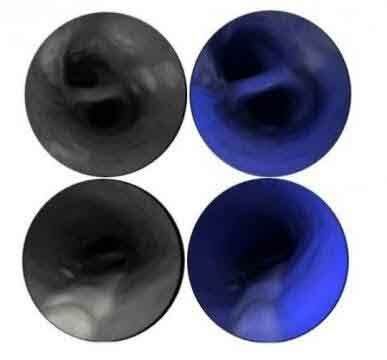 The scanning fiber endoscope, or SFE, used in the study was invented and developed by co-author and University of Washington mechanical engineering research professor Eric Seibel, Ph.D. He originally designed it for early cancer detection by clearly imaging cancer cells that are currently invisible with clinical endoscopes. The Michigan Medicine team used the instrument for a new application: acquiring high-quality images of possible stroke-causing regions of the carotid artery that may not be detected with conventional radiological techniques. Researchers generated images of human arteries using the SFE, which illuminates tissues with multiple laser beams, and digitally reconstructs high-definition images to determine the severity of atherosclerosis and other qualities of the vessel wall. “In addition to discovering the cause of the stroke, the endoscope can also assist neurosurgeons with therapeutic interventions by guiding stent placement, releasing drugs and biomaterials and helping with surgeries,” Seibel says. In addition, the SFE uses fluorescence indicators to show key biological features associated with increased risk of stroke and heart attacks in the future. “The ability to identify and monitor the biological markers that render a plaque unstable and at risk for rupture could enable the detection of individuals within high-risk populations who are most likely to suffer from cardiovascular events, and therefore benefit the most from preventive treatment during the asymptomatic stage,” says B. Gregory Thompson, M.D., professor of neurosurgery at the University of Michigan Medical School and a senior author on the new paper. All research is in the pre-clinical phase.